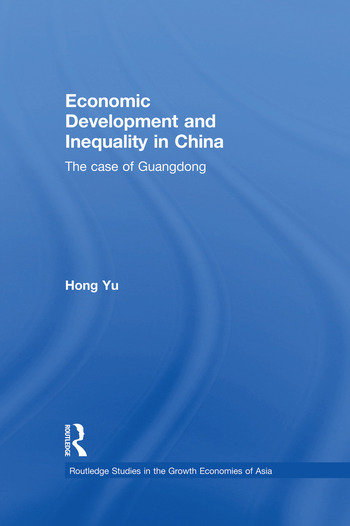 The conventional belief that all regions have equally benefited from China’s remarkable development over the last three decades is subjected to criticism in this book as Hong Yu systematically analyses the issue of regional inequality during the post-1978 period using the case of Guangdong. Guangdong is one of the key industrial centres and economic powerhouses in China and as a pioneer province, instigating economic reform as China opened up to the world, it offers an ideal focus upon which to question and enrich the Western theories of economic geography and regional disparity. Based on field research, analysis of geographic characteristics and regression models, this book illustrates how Guangdong’s impressive development record has been marred by its rising regional disparity, investigates the main causes of this disparity, and draws conclusions regarding the lessons China can learn from it. Economic Development and Inequality in China will be of interest to students and scholars of Chinese economics, Chinese regional studies, economic geography and China Studies. Hong Yu is a Visiting Research Fellow at the National University of Singapore. His research interests lie in the field of regional economy. He is the author of a chapter on China’s two delta regions in the book "China and The Global Economic Crisis". Hong Yu is a Research Fellow in the East Asian Institute at the National University of Singapore.